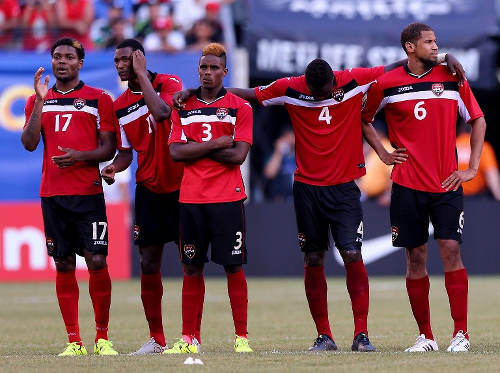 The Trinidad and Tobago National Senior Team have delivered a stark, public message to the new administration of the Trinidad and Tobago Football Association (TTFA): Pay or we won’t play! In a press release, delivered by national captain Kenwyne Jones’ publicist, Tenille Clarke, the “Soca Warriors” have threatened to withdraw their services for next month’s Copa América Centenario Play Off against Haiti unless the TTFA satisfies its debt to the players. 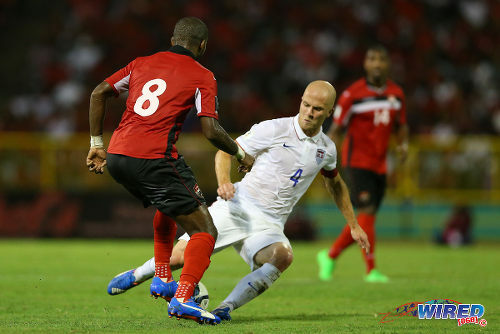 Trinidad and Tobago are due to face Haiti on 8 January 2016 at the Estadio Rommel Fernandez in Panama City, Panama with the winner advancing to the 2016 Copa América competition. However, the Warriors are still owed match fees for last month’s Russia 2018 World Cup qualifiers against Guatemala and the United States and for a friendly against Nicaragua in October. Jones, who said he was speaking on behalf of his “distressed teammates”, said it was a collective stance. 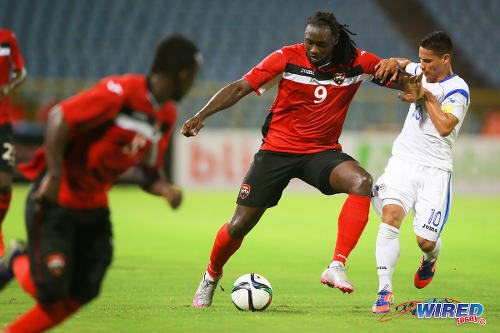 Photo: Trinidad and Tobago captain Kenwyne Jones (centre) holds off Nicaragua midfielder Elvis Figueroa during international friendly action at the Hasely Crawford Stadium. The stance is a significant broadside to new TTFA president David John-Williams, who was only elected on 29 November 2015. Williams, who relinquished his role as W Connection president after the elections, was the employer of two national senior team players—Daneil Cyrus and Mekeil Williams, who are both out on loan—up until a month ago. And another five Warriors including the national captain are former Connection players. 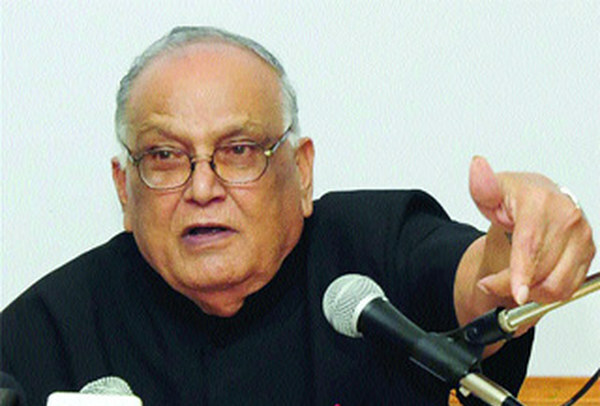 His history with the national players now appears unlikely to be an asset during his presidency. A Soca Warriors player, who spoke on condition of anonymity, confirmed that the press release was a group decision that the players agreed to today via What’s App messages. He said the squad felt slighted by the pace at which the debt was being settled, particularly as they had done everything they could get a bumper crowd for the November 17 World Cup qualifier against the United States. But, with Christmas looming, they hope an agreement can be reached soon. 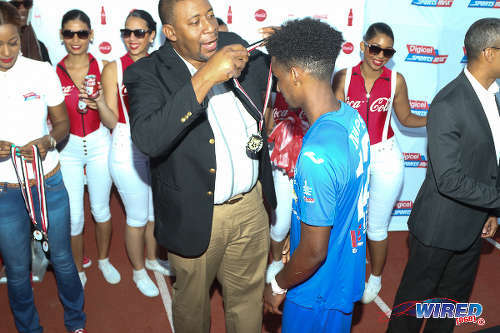 However, Williams insisted that Jones has not contacted him since he became TTFA president and the debt to the players is an inherited issue, which, after less than two weeks on the job, he is still coming to grips with. 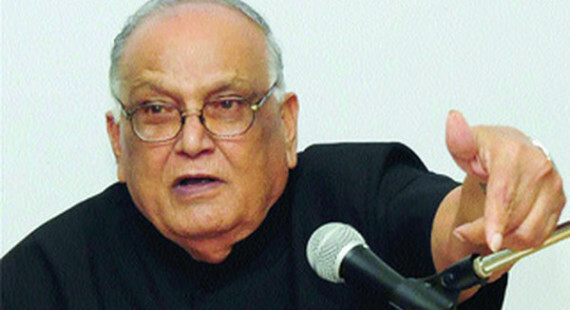 Former TTFA president Raymond Tim Kee, who is also the Port of Spain mayor and PNM treasurer, and his estranged general secretary Sheldon Phillips oversaw the deal with the Warriors. But, although there were over 20,000 spectators at the Hasely Crawford Stadium, the TTFA did not honour its arrangement with the Warriors. Phillips was fired before the United States match and was replaced by acting general secretary Paula Chester-Cumberbatch. “The players were promised their money (on) the Friday after the USA game,” Williams told Wired868. “To the best of my knowledge, that would have been the 19th. I came into the office two weeks after that. “What I met was that we were still collecting the money from the ticket outlets and some of that was post-dated cheques. Trinidad and Tobago head coach Stephen Hart, who is with his family in Canada at present, said he was surprised by the players’ release and hoped the matter is resolved quickly. “I only just got (the press release) myself and I am in no position to comment about that,” Hart told Wired868. 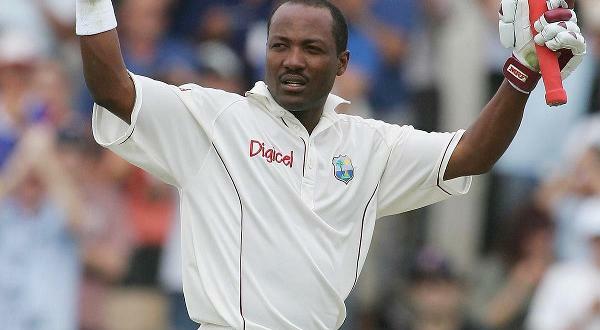 “As a coach, I am not usually involved with any financial dealings with the players. (But) I think it is a misunderstanding. “A new person comes in (as TTFA president) and is unsure about what negotiations went on before him. So I think it might be hasty. Jones described the situation as “as an unfortunate development on all fronts” but pointed out that the players had sacrificed their personal and professional schedules for the national team and produced commendable results with limited resources. Now, they want the TTFA to respect its agreement with the players. 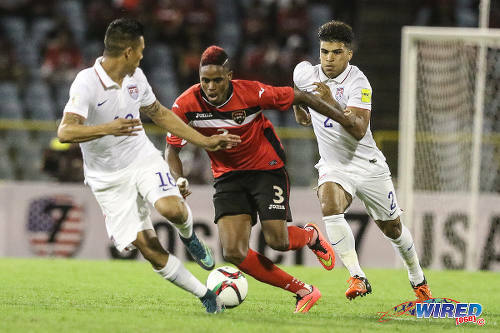 Photo: Trinidad and Tobago football captain Kenwyne Jones (background) hugs international teammate and goalkeeper Marvin Phillip after their penalty shootout loss to Panama in the 2015 CONCACAF Gold Cup quarterfinal. “Of course, we want to play,” said the Cardiff City forward. “We want to represent our country to the best of our abilities. We have a talented squad that is eager to give their all. Williams said the players’ stance will be addressed formally at the new TTFA’s first board meeting on Wednesday December 16. The new president will also speak to Hart, via Skype, on Saturday morning in a meeting that was arranged before the players’ stance. 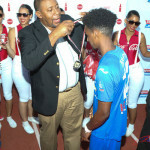 The TTFA president did not suggest that he would try to speak to the Warriors or the national team captain before then. “The first board meeting is next Wednesday,” said Williams, “at which time all those matters would be raised. Williams subsequently amended this position, as he arranged an emergency meeting with his executive for tomorrow to discuss the players’ press release. 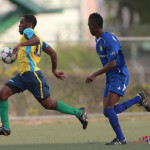 The Warriors’ stance is a notable shift in their relationship with the TTFA, as they often hinted at a need for change or asked for improved administration but rarely chose open confrontation. 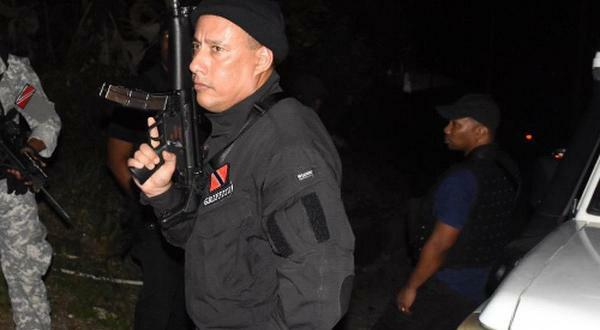 Jones asked the Trinidad and Tobago public to understand their decision and expressed hope that a resolution would be swift. Editor’s note: TTFA president David John-Williams confirmed that he will hold an emergency executive meeting tomorrow with his vice-presidents to discuss the players’ stance. And I just checked a calendar. Today is four weeks to the day until that Jan 8th match. I would say the players are giving the TTFA a very reasonable amount of time to work this out. Clearly they want to play. This kinda thing will NEVER stop, despite who in charge! Past jokers, present jokers and future jokers! Is decades now this issue keep arising. Eternal problem……..
There’s a long line of entities trying to collect dollars from the TTFA – an organization severely strapped for funds. Just recently we heard that if a certain former coach isn’t paid by a deadline now expired, the country would be banned from World Cup 2022 qualifications. I imagine there are many others quietly trying to collect debts from the TTFA. Now the players have up the ante – threatening to withhold their services. I guess they’re using their leverage in an attempt to jump to the head of that debt collection line. Good luck to Mr Williams in managing this inherited crisis. I suggest he invest in some good lawyers and go after Jack W. and OLIVER Scamps to recover the millions stolen from the TTFA. I wish I had more thumbs to give you there! So far, DJW has been saying the past is the past. But the past is affecting our future. So I disagree. And there will be more on that in the future for sure. Fair point Mr Monti – i know England players tend to give back what pay they get for representing their country to charity – what do Italian players do? I understand what our Warriors are saying about being promised compensation for outstanding fees but I would warn them about history possible coming back to haunt the very thing that they have so work hard to achieve,otherwise all that would happen is if the President cannot find the money in a timely manner,he would be left with no other choice but to replace the Senior team with the younger youthful players or other senior players waiting for the opportunity to represent our country at this possible job fair for the others that are not willing to attend ? SHAME, SHAME, SHAME where are all the TT sports people?????????? where are your voices….